On September 4, Wild Idaho Rising Tide (WIRT) filed an amended notice of appeal and petition for judicial review of the June 21 approval of a state, non-navigational, encroachment permit for construction of four proposed, permanent and temporary, Burlington Northern Santa Fe Railway (BNSF) bridges and associated fill in the navigable waters of Sand Creek and Lake Pend Oreille near Sandpoint, Idaho . The notice requested county court analysis of the entire, Idaho Department of Lands (IDL), administrative record, including public and agency comments, hearing testimony and proceedings, and the BNSF application. Local attorney Wendy Earle electronically filed the petition and her notice of appearance on WIRT’s behalf, replacing and expanding the initial notice of appeal hand-delivered pro se (without lawyer representation) with a $500 bond to the Idaho First Judicial District Court in Bonner County, on July 20 [2-5]. 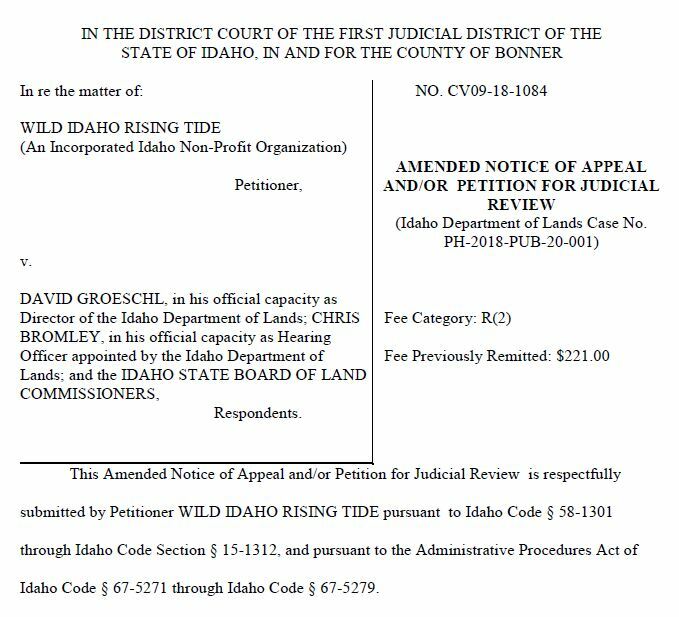 The lawsuit names as respondents IDL director David Groeschl, IDL-appointed, May 23 hearings officer Chris Bromley, and the Idaho Board of Land Commissioners. Copies of the documents were also sent via email to Idaho attorney general (AG) Lawrence Wasden, chief of the AG’s natural resources division Darrell Early, and the respondents’ lawyers, deputy AGs Angela Kaufmann and Joy Vega in Boise, who filed a notice of appearance on August 20. In an opening procedural overview, the notice describes a filing time extension granted by First District Judge Barbara Buchanan, and notes that petitioner WIRT has exhausted all administrative remedies. It also references the hearing officer’s preliminary order and IDL director’s final order issuing the BNSF permit and culminating from two recorded, May 23, administrative hearings held by IDL and the land board in Ponderay and Sandpoint. Because IDL failed to properly prepare and publish on the IDL website the final transcripts of those sessions with the legally required, attested signature of the hearings reporter, WIRT sent a request for the official transcripts and pertinent, public records, and mailed a $100 deposit for estimated copying fees to IDL . We also downloaded and printed the full record, including the BNSF application and state documents, from the IDL website. The notice’s overview of law and facts asserts that petitioner WIRT collectively has standing as an aggrieved party appealing and seeking judicial review of these state actions, because its board members and multiple, WIRT and associated members requested and appeared at the formal hearings and offered comments for the public record. Of 31 citizens who testified at the morning and evening hearings, 21 spoke in opposition to the BNSF rail bridge expansion project, and ten supported it. As an Idaho non-profit organization, who applied for state incorporation on Friday, August 31, exactly seven years and five months after formation as a climate activist collective, WIRT works to protect environmental values such as water and air quality and habitat for fish and wildlife like threatened bull trout. WIRT members are concerned about train derailment dangers and environmental health and safety issues arising from increased fossil fuel and hazardous materials infrastructure and traffic capacity, as we reside, recreate, and enjoy the aesthetic qualities of Lake Pend Oreille and Sand Creek. Some WIRT activists, as registered tribal members of the Confederated Salish and Kootenai bands off the Flathead Reservation, honor the 1859 Stevens treaty granting reserved fishing rights in the Clark Fork River that flows into the lake. Considering all of these circumstances, approval of the BNSF encroachment permit violates WIRT’s substantial rights and would inflict actual and direct harm, if the state does not vacate this challenged, permit decision. Idaho laws uphold a standard of judicial review for a court to affirm agency actions unless it discerns that the agency’s findings, inferences, conclusions, or decisions are “in violation of constitutional or statutory provisions, in excess of the statutory authority of the agency, made upon unlawful procedure, not supported by substantial evidence on the record as a whole, or arbitrary, capricious, or an abuse of discretion.” WIRT is asking the court to deliberate whether IDL’s final order partially or totally lacks a basis in law, and is arbitrary, capricious, etc., as previously quoted and as consistent with articulated public trust standards. Our notice of appeal and petition for review further suggest that IDL failed to consider the relevant evidence and information submitted by WIRT and other commenters and testifiers, and improperly weighed the “lake values” enforced by the Idaho Lake Protection Act (protection of property, navigation, fish and wildlife habitat, aquatic life, recreation, aesthetic beauty, and water quality, not to mention public health, interest, safety, and welfare) against the primarily private, economic benefits of the permit applicant and questionable public advantages of the project. IDL’s findings and conclusions, stated in the preliminary and final orders, lack support in the record and improperly rely on information not contained in the record. Moreover, IDL unlawfully and without justification failed to give “due consideration” to protection of lake and stream water quality and threatened bull trout, because the Idaho Department of Environmental Quality, Idaho Department of Fish and Game, and U.S. Coast Guard have not yet respectively issued a mandatory water quality certification with permit conditions, a determination of project impacts on native fish and habitat modification, and an environmental assessment or more comprehensive environmental impact statement implicating potential, adverse, direct or cumulative, project effects on natural and human communities. The notice also claims that IDL usurped the Idaho Stream Protection Act, by exercising jurisdiction over alterations of the Sand Creek channel with a lake encroachment permit, and disregarded tribal treaty rights to fish for bull trout and other species at “usual and accustomed places” in Lake Pend Oreille. WIRT petitioners also take issue with IDL’s delineation of the scope and legal effect of the 1864 railroad right-of-way land grant encompassing present and proposed BNSF tracks and bridges and other ownership of lake beds and banks. To relieve these violations of state and federal laws and agency authority and discretion, WIRT is asking the court to vacate either all or the inappropriate portions of the IDL final order, remand the BNSF application to IDL for further, necessary proceedings, and award these humble petitioners reasonable court costs, attorney fees, and other relief that the court deems just and proper. During about six weeks since our early-July decision to challenge the state permit, WIRT activists searched within our Northwest network for crucial, attorney representation and hearing testifier participation in this #No2ndBridge lawsuit . On August 7, within the 14-day opportunity provided by Judge Buchanan, WIRT filed (pro se again) a request for a 14-day extension to file an amended notice of appeal and petition for judicial review, in response to the court proposing to dismiss the case and strike the original notice of appeal from the public record, on procedural grounds on July 25 [8-10]. As rain briefly cleared wildfire-smoky air on August 17, WIRT received mailed notification of the August 15 order granting our request, which provided a time extension of 14 days and the Labor Day weekend to establish and advance our case. While grassroots activists struggled to access local courts in late July and August, BNSF intensified its aggressive, pro-bridge campaign. According to a Sandpoint Farmers’ Market, WIRT outreach table visitor informed by an Idaho legislator, BNSF stopped all train traffic between Spokane and Sandpoint for hours on several occasions, while BNSF officials cajoled first responders and Idaho politicians with tours and $100 bottles of wine on upscale trains, observed crossing Sandpoint by the #IDoiltrainwatch and #WAoiltrainwatch . But emergency responders, transportation officials, and citizens continued to voice their concerns about north Idaho, BNSF infrastructure expansion, to a Bonner County Commissioner candidate . Meanwhile, at yet another guest presentation, BNSF attributed rumors about unsafe conditions and repair work on the current, 113-year-old, almost mile-long, Lake Pend Oreille rail bridge to opponents of the second, parallel, $100 million-plus span that would purportedly alleviate a rail traffic choke point by 2024 or 2025 . WIRT conversations with attorneys revealed that BNSF had attempted a similar bridge expansion in recent years, but could not meet environmental and safety standards. Compounding six regional rail accidents in 2017, a BNSF train spilled piles of corn across a half-mile of tracks near the Sandpoint airport, during the Bonner County Fair on August 10 . The incident attracted animals and birds to feed on the grain, leaked by overfull or unclosed rail cars, along a route where trains can travel 60 to 70 miles per hour. Due to unhealthy air quality, tragedies among allied, indigenous, canoe families, and a looming, attorney-less, filing deadline, WIRT postponed the fourth, annual, multi-event Panhandle Paddle, typically scheduled on the last weekend of August, on the 24th to 26th this year . Instead, WIRT community organizer Helen Yost, who is relieved, grateful, and emboldened by competent and knowledgeable, lawyer assistance, brought the 2000-plus pages of the public record and met with later paid and retained attorney Wendy Earle on August 23, to discuss and develop strong arguments against the IDL permit [16-18]. By the time that the Panhandle Paddle direct action training workshop, #No2ndBridge discussion, and kayaktivist flotilla joined global, Rise for Climate protests on September 7 to 9, Wendy Earle and WIRT activists, advised by allies and fellow testifiers, had reviewed Idaho case law and filed a timely, early September, amended notice of appeal and request for judicial review of the state’s encroachment permit for BNSF’s Sandpoint Junction Connector project. Attorney Earle and WIRT activists received the 2133 pages of the IDL-supplied administrative record and hearing transcripts on September 26, and are currently, thoroughly scrutinizing them, to potentially file any objections to their composition that may arise. The First District Court of Idaho notified WIRT on September 28 that it has assigned District Judge Cynthia Meyer of Coeur d’Alene to preside over our case and hearings in Bonner County. We may supplement our arguments presented in the amended notice of appeal/petition for judicial review, asserting and discussing in greater, specific detail at least a dozen issues in this case, including those discovered during record review. Covered by two Spokane television stations, WIRT testified at the May 23 hearings that construction and operation of BNSF’s Sandpoint Junction Connector project – over two miles of doubled tracks, three permanent, rail bridges, and two temporary, work spans adjacent to the present rail route across Lake Pend Oreille, Sand Creek, and Bridge Street in downtown Sandpoint, Idaho – “will clearly pollute our drinking water.” [19, 20] “Pile driving would release train-spewed, lake bed coal and other railroad deposits containing arsenic, mercury, lead and other health-risking compounds… This could potentially be hazardous to the residents living and playing around Lake Pend Oreille. It would almost certainly pollute lake, river, and aquifer water…already polluted by four railroads, Highway 95, and a remediation site” . BNSF’s proposed rail bridge and track expansion would accommodate and expand the ongoing, heavy industrial pollution and derailment risks of Northwest coal, oil, tar sands, and hazardous materials pipeline-on-wheels, and thus jeopardize Lake Pend Oreille water, air, lake beds, and lives and the local and regional environment and economy. The air- and water-degrading, life-threatening, climate-wrecking, railroad transport of fossil fuels across the lake, creek, and north Idaho “would exacerbate climate change through added oil and coal shipments…[and] increase the likelihood of a catastrophic spill, which would damage water quality and wildlife habitat, threaten a source of the city’s drinking water, and dim recreational values” . A 2017 emergency response plan for the impacted watershed revealed that project-impacted communities need better equipment and navigation capacities to effectively manage significant transportation spills in or around Pend Oreille lake and river . “Additional equipment is available in Spokane and Whitefish, Montana, but the time to retrieve it would be far too long to successfully contain a spill…During low water times, there are no launch sites close to the existing BNSF bridge. The closest, all-weather ramps are at Hope [17 miles] and Laclede [16 miles]” . As WIRT and allies state in our initial notice of appeal of final order approval of the BNSF encroachment permit and in our informal, widely circulated, hard copy and online Petition to Deny and Revoke Permits for the BNSF Sandpoint Junction Connector Project, this railroad infrastructure expansion and resulting, bi-directional, train passage would significantly, cumulatively, and adversely impact many aspects of our lives and livelihoods [2, 22]. The project would jeopardize regional, lake and aquifer water resources, air quality, wetlands, shorelines, native fish, wildlife, and threatened bull trout and their habitats, indigenous rights and cultures, human and environmental health and safety, emergency response capacities, earthquake and disaster resilience, historic sites, vehicle travel at rail crossings, boat navigation, tourism, recreation, businesses, residences, property and economic values, and other, public interest factors. This permit approval would also increase the ongoing and potential traffic, noise, pollution, and accident and derailment dangers of fossil fuels and hazardous materials trains that we have actively denounced through numerous, citizen, group, and government, public comments, hearings, protests, and court cases over the last decade. We request that local, state, and federal, elected, appointed, and agency officials conduct rigorous reviews and analyses of this project, including environmental impact studies and statements, and denounce, deny, and revoke all permits for this negligent and culpable project. Contribute to Legal Efforts & Expenses! WIRT needs your volunteer and donation assistance with our appeal of the Idaho Department of Lands encroachment permit for BNSF’s proposed rail bridge and track expansion across Lake Pend Oreille and Sandpoint! Three amazing contributors have already given $455 of the $4,656 costs of this lawsuit, including $162 for printing, $273 for the IDL administrative record, $721 for the bond and filing fee, and $3,500 for our attorney. We anticipate these #No2ndBridge litigation expenses to grow by the end of 2018, as we request and greatly appreciate your support in any way or amount that you can. We are advancing this lawsuit for our community, as one $25 funder described, to “not let BNSF and the State of Idaho get away with their ruthless disregard of our current and future well-being!” Please visit the WIRT facebook and website pages for ongoing case updates, contact WIRT for further information about the appeal, and contribute online, via the “Donate to WIRT” link on our website, or through our mail boxes at 301 North First Avenue, Suite 209B, Sandpoint, Idaho 83864, or P.O. Box 9817, Moscow, Idaho 83843 . Thanks!